For both architecture and exploration Red Vienna underlines the hidden value of devoting a little extra time to quality and beauty. 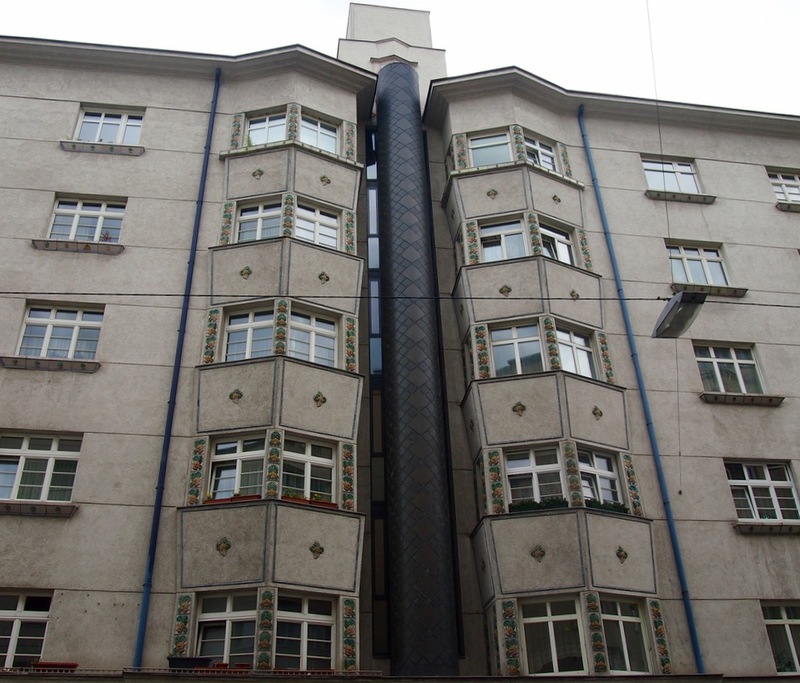 Almost a year ago I spent a few days trekking across Vienna with the aim of seeing every noteworthy social house built during the Red Vienna period (1919-1934). It was quite a challenge, this was a very productive period of housebuilding, with 60,000 units built and many houses still standing (a lot of which are worthy of note). As I was to find out, this is a pretty terrible way of exploring Vienna (or most places for that matter), simply trying to see everything rather than stopping to enjoy the particular details. I know this because I was lucky to have a close friend accompanying me who was less inclined to see as much as possible. As such, he wasn’t afraid to put his foot down once in a while and insist on pausing for a bit of café culture. Notwithstanding the fact that stopping for coffee in Vienna is a lovely thing to do, it also created the space for serendipity to strike, most notably in a café on the “Ringstraße des proletariats”, where we met a lady called Jutta Schwarz. Herwegh-Hof on the “Ringstraße des Proletariats”. 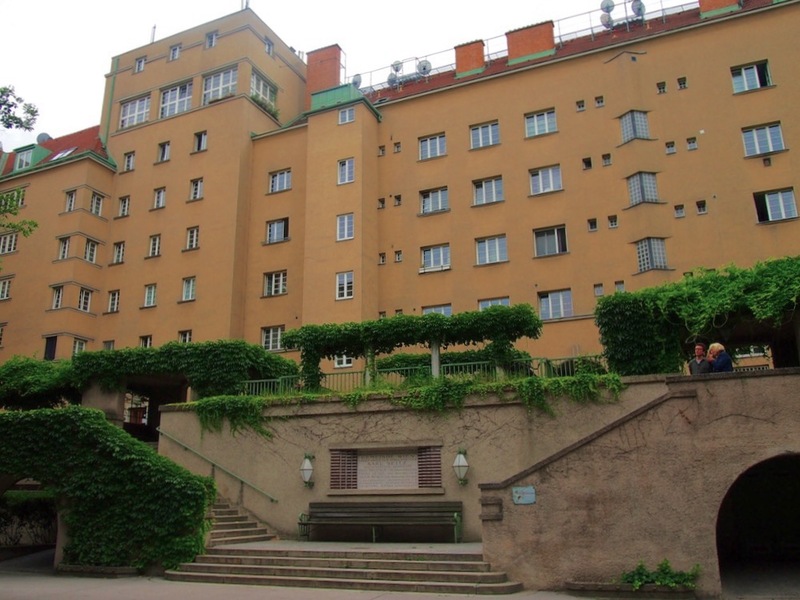 Jutta had grown up in Herwegh-Hof, one of the big complexes that line the Ringstraße. That morning she was celebrating having just finished a month-long series of tours of the area. She was, however, kind enough to give one more private tour in the final few hours of our stay. In a single hour I gained far more of an insight about the philosophy behind the architecture than all the rest of the time we were there. In both architecture and exploration the whole thing was a lesson in the right balance between quality and quantity. As Jutta explained on our tour, Vienna’s government was notable in this era for adopting a direct-labour programme which sought full employment, a pretty essential policy in a city suffering high unemployment (largely brought about by the collapse of the Austrian Empire). But the government’s approach differed from other socialist governments of the time who tended to advocate a Taylorist method of building governed by a scientific management of labour and an emphasis on pre-fabrication and mass production. In contrast, the Viennese government was more concerned with the subtle yet vital value of engaging a wide range of tradesmen and materials in the production process and taking care over the design of each building. Consequently, a whole host of artisans and sculptors were involved in the massive programme of house-building. The houses still bear the mark of this policy as you can find arts and crafts features throughout: magnificent statues, intricate carvings, vivid ceramics, metal work and masonry, with plenty of fountains and gardens and an abundance of well-ordered communal space. As she pointed out each detail, Jutta was keen to highlight how sparingly things were employed, especially when considering their place in the wider whole. Indeed, while things look good, the decoration is far from overblown, the houses are decorated in muted colours, nothing is conspicuously useless and decorative elements are subtle, it’s like a lovely little treasure hunt, you really have to look carefully to appreciate them. This relatively ambivalent attitude to decoration is where the huge influence of the Wiener Werkstatte comes to the fore. Influenced by John Ruskin, William Morris and the British Arts and Crafts movement, the Wiener Werkstatte began in the early 20th Century as a loose collection of designers who sought to rescue craftsmanship from oblivion by compromising with modern production processes and using decoration only where appropriate. 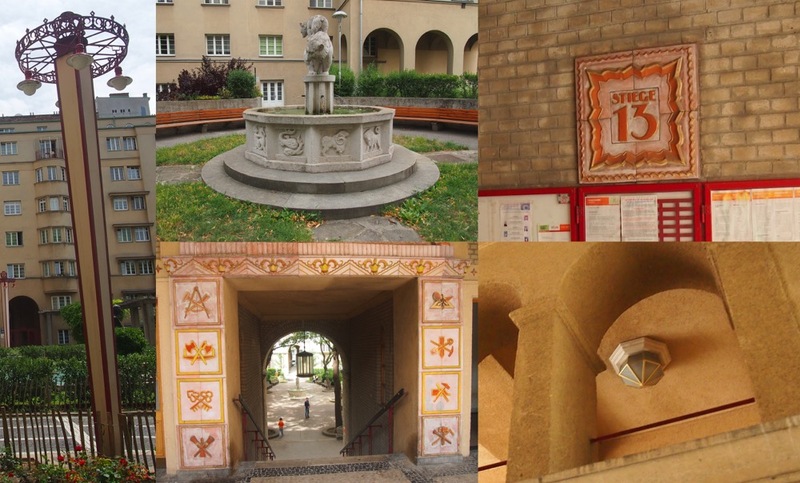 Following their manifesto, decoration in the Red Vienna housing was used where it was appropriate, but not as a matter of course. Rather, the first priority was to build with good proportions using good materials (again echoing the Werkstatte manifesto). In these conspicuously solid housing complexes, still standing after almost a century (when the average lifespan of a building these days is in the region of thirty years), you can see how much thought went into how life would be experienced in the place, with an excellent balance of private and public space. And this is where the decorative features come into their own. Because the idea was not just to keep the artisans occupied (a useful end in itself), but to surround Vienna’s working class with beautiful objects, and as a result make these people feel more beautiful themselves. The sentiment is echoed in the city councillor Franz Steigel’s speech at the opening of Vienna’s beautiful Amalienbad swimming pool in 1926, which he described as “a symbol of the rise of the working classes to a new culture”. Amalienbad is instructive. Now regarded as a masterpiece it was derided at the time as an expensive folly and used by the embittered landlord class as an example of the wastefulness of the city’s socialist government. With a stockpile of other examples of such seeming waste the tide began to turn against Red Vienna’s approach to the built environment and when the Great Depression hit, austerity quickly became the order of the day. Things did not end well for the socialist government. With a note of sadness, Jutta described how in February 1934, the army, backed by fascist paramilitary, seized power. After a final stand at the Proletarian Ringroad’s fortress-like Reumann-Hof (named after the city’s first socialist mayor) many socialists were murdered and the rest were forced underground. Considering the fact that such a policy culminated in a lot of its progenitors beings killed, you’d be forgiven for thinking it was a failure. And at face value, attempting to forego the cheapest approach in public works projects could be seen as pretty counter-intuitive to a government whose grip on power was relatively recent and tenuous. Moreover, the rapid rejection of Vienna’s direct-labour programme doesn’t benefit from direct comparison with Moscow’s much more long-lasting approach of mass-produced building using pre-fabricated elements. Indeed, this was and still remains out of step with the cost-conscious culture that has influenced even Communist countries since the advent of capitalist modernity. But this was a genuine attempt to recast the concept of value, to behave as if there were alternatives to the capitalist emphasis on cost-saving and profit margin. And as we walked with Jutta through the Proletarian Ringroad, slowly observing the details, rather than ploughing through all of Red Vienna’s social houses, I couldn’t help but realise how deeply valuable a little additional craft can be. As we live through our own period of austerity, where a results-driven cost-benefit analysis governs production even more acutely than in the Soviet Union, we have resolutely lost sight of the ineffable value of good craftsmanship, the kind so vehemently advocated by Vienna’s socialist government and the Werkstatte before it. 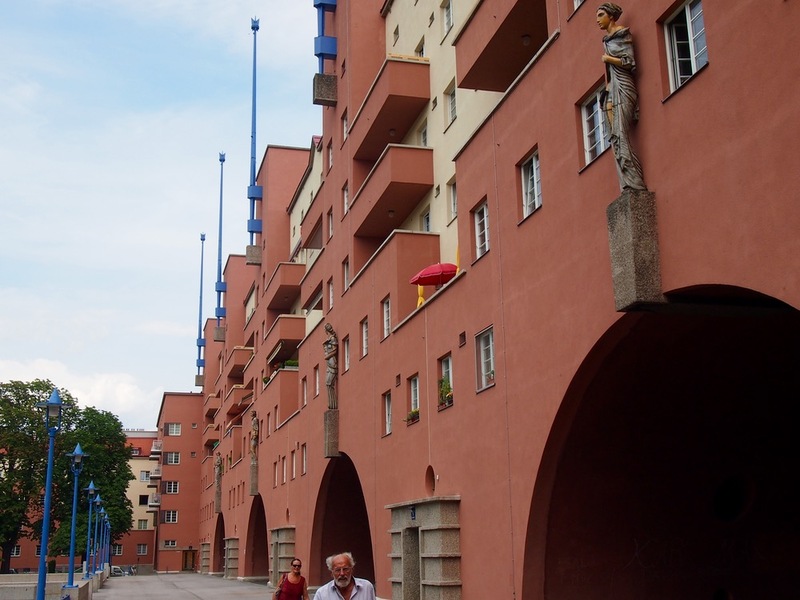 Yet looking at Vienna today it almost goes without saying that there is no longer the same zeal for social housing, let alone beautiful social housing. As we saw, many of the shops and social facilities in the Ringstraße were not functioning or were no longer being used for their original purpose. The houses themselves are still in remarkably good condition, but there has been much less ambition in new housebuilding. Moreover the regime of rent control is rapidly diminishing. Rent control no longer applies to houses that were built after 1945 (although of 280,000 private rented flats in the city, 220,000 were built before then) and a series of laws since then have made tenancies more flexible and made it much easier to ask for market rates and to charge various premiums, for instance, for prime locations. And in 2008, thirty years after it was first introduced in the UK, right-to-buy began to rear its ugly head. But this is same old same old, with the trend following that of other European cities (albeit less severely), so Vienna’s government shouldn’t be judged too harshly. 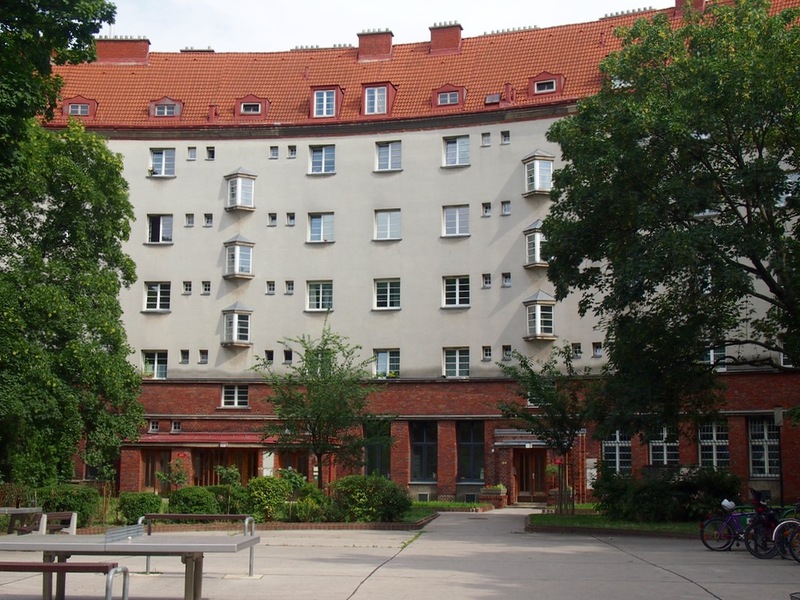 Besides, there’s something pretty successful about the continued presence of massive complexes like Raben-hof, Freidrich-Engels-Hof, and Reumann-Hof to name just a few of the huge blocks dotting the city. That they exist is sufficient for now. They stand in wait, a potent reminder that we can do better. Thanks for the article! 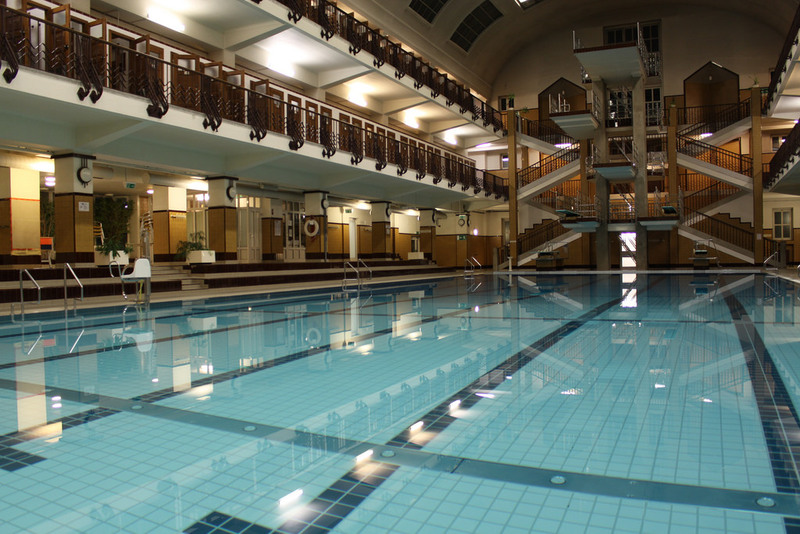 I used to live in Vienna (and actually went swimming every week at the Amalienbad). 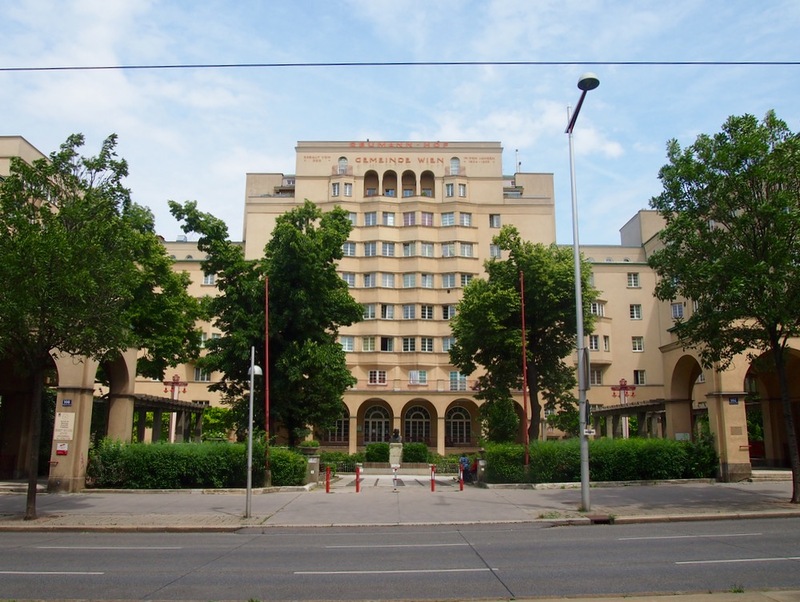 I always used to show people visiting me the Karl-Marx-Hof so that they could see another side of Vienna to the touristy chocolate box image on the postcards. I still think today's city fathers (wherever in the world) could learn something from Red Vienna.